Mental-health advocates say Maryland desperately needs more hospital staff: The Washington Post/Josh Hicks; photo: Maryland state health worker Catherine Frazier calls on the state to hire more mental-health employees during a news conference in Catonsville, Md., on Aug. 8. Mental-health advocates on Monday demanded that Maryland hire more state hospital staff and reopen facilities that once housed patients, arguing that the moves could relieve pressure on jails as a backlog of people await court-ordered psychological evaluations. Union officials and about two dozen state psychologists, social workers and direct-care personnel issued the call for action at the sprawling Spring Grove Hospital Center in Baltimore County, saying their plan could eliminate the wait lists. 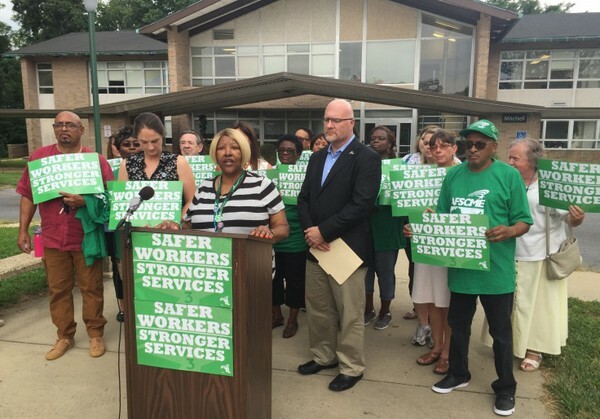 Officials with AFSCME Maryland Council 3, the largest union representing Maryland public employees, released figures from the Department of Health and Mental Hygiene showing that the agency has more than 500 staff vacancies. They said the department should fill many of those openings with mental-health workers to help trim the backlog. Many people who face criminal charges are ordered by judges to undergo psychological evaluations or treatment if they are too mentally ill to understand their surroundings or comprehend that they have committed a crime. In May, the health department reported that 84 inmates were on wait lists for such psychiatric help. The state detains those people in jails, which are not designed to meet their needs, often for weeks at a time, which mental-health experts say is ineffective and expensive. A Washington Post analysis this year found that Maryland’s state psychiatric hospitals had 1,000 beds in 2012, with most of them filled by people transferred from jails. Consultants for the state estimated in 2012 that the hospitals needed more than 200 additional beds, but the health secretary at the time rejected that conclusion, saying the state could relieve the pressure with better management and increased use of community-based treatment. Judges have complained that the state is defying their orders and effectively allowing people to be detained illegally. Some have required health officials to appear in court to explain why they should not be held in contempt. Maryland Health and Mental Hygiene Secretary Van Mitchell has asked the courts to be patient, noting that he recently spent an extra $8.2 million on staffing and overtime to help address the situation. He also created a work group to develop solutions. The task force completed draft recommendations in July, calling for the state to increase bed capacity at its residential treatment centers and expand outpatient services for people who are required by court order to seek help. Mitchell also has said that he is exploring options for placing some patients in private hospitals, and that he wants to request construction of a state-of-the-art mental-health facility that would be the first new state-run hospital in more than 40 years. Advocates said the department’s efforts to hire more staff might come in vain unless it also addresses what they described as inadequate pay for state mental-health workers relative to the salaries they can earn with private organizations.